Summers in Maryland aren't summer without crabs. And not just any crabs: We're talking about the delicate, sweet blue crab bounty of the Chesapeake Bay, whose Latin name Callinectes sapidus means "beautiful swimmer." There are few things that get Marylanders more excited than tearing into a bushel of red-shelled beauties encrusted with crab seasoning, or enjoying the delicacy of a fried soft shell, accompanied by an ice cold brew. Marylanders prepare hard shells and other seafood by steaming them, rather than the boiling that is common along the rest of the East Coast and Louisiana. Marylanders will tell you that boiling makes the crabmeat wet, rather than just moist. (Boiling proponents argue that steaming pushes the internal temperature too high and dries out the flesh.) But oddly enough, Marylanders complain that the seasoned boiling water makes the crab taste too evenly seasoned — they prefer the variety in heat and seasoning that comes from tasting the spice that rubs on to the crabmeat from their fingers. As a result, in Maryland, steamed is usually the only option on offer. What's Special About Maryland Crabs? Blue crabs can be found in waters as far north as Nova Scotia and as far south as Uruguay, but the crustacean's strongest association has always been with Maryland. According to the Maryland Department of Natural Resources, approximately 50 percent of the country's blue crab harvest comes from Maryland waters. The lazy might prefer larger Dungeness crabs from the West Coast, which are much larger and easier to eat. Many restaurants use cheaper pasteurized crab from Asia for their dishes. But not all crabs are made equal. Gjerde notes that other species of crab lack the depth of flavor and delicate texture of blue crabs. "The seasons have a lot to do with it," he says. "The season typically starts around [April] and lasts until the cold weather comes around in November. The seasonality has certainly affected our appreciation for blue crab over the years, and it is why it holds the place that it does in the Chesapeake way of life." 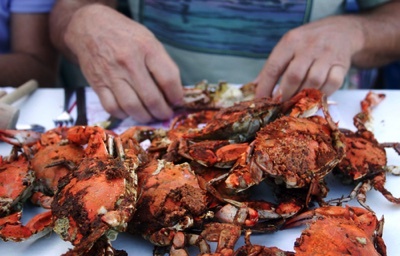 From a scientific perspective, the need for hibernation is the main reason Maryland crabs taste better than other types of crab — and also tastes better than blue crabs from other waters, according to Steve Vilnit of the Maryland Department of Natural Resources, Fisheries Services. He explains that just like other creatures that hibernate, crabs need to build up fat stores to sustain them through the dormant period. "This gives our crabs a buttery flavor that you won't find anywhere else," Vilnit says. "To someone that knows what they are looking for, it is possible to tell by eye which ones are from Maryland, but most likely it will be by taste." What are Soft Shell Crabs? Many consider soft shell crabs to be a delicacy, and a way to enjoy crabs without the arduous task of picking them. Soft shells are any crab that has molted within the last 12 hours. During that time the shells are soft and papery, so they can be eaten whole, claw to claw, with the exception of the gills and parts of the abdomen. These parts are removed prior to being cooked, so diners can eat with abandon. Crabs typically molt between 18 and 23 times during their life, and they can mate only when a female is molting. Because the crab spends only about 12 hours as a soft shell, crabbers look carefully for the sign that a crab is about to molt — the development of a line on the last leg, known as the paddler fin, that starts out white and progresses to pink and then red as it grows closer to molting. Before finding their way to a plate, soft shells are typically fried with a seasoned batter or sautéed. It's hard not to love something deep fried, but many natives consider sautéing the better option to not overwhelm the sweetness of the meat. Both methods preserve the fatty mustard inside and typically lead to a crab gushing with juice. At most Maryland seafood restaurants, soft shells are served as a sandwich with mayonnaise, lettuce, and tomato or plain on a platter to enjoy with a fork and knife. No matter how you eat 'em, you're in for a treat! These pre-molting crabs, known as peelers, are usually held in a special shedding tank until they bust out of their old shells. The then-valuable softies are removed from the water to prevent hardening of their shells before they are cooked and eaten. At most Maryland seafood restaurants, soft shells are served as a sandwich with mayonnaise, lettuce, and tomato or plain on a platter to enjoy with a fork and knife. One thing's for sure, anyway you prepare them or eat them, crabs never disappoint. This is the Crab Page! How to actually eat 'em!